Mayor John Cranley spoke with Hamilton County Prosecutor Joe Deters last Thursday and again on Tuesday to discuss filing a public nuisance lawsuit against the owners of the 872-room hotel on West Fifth Street. 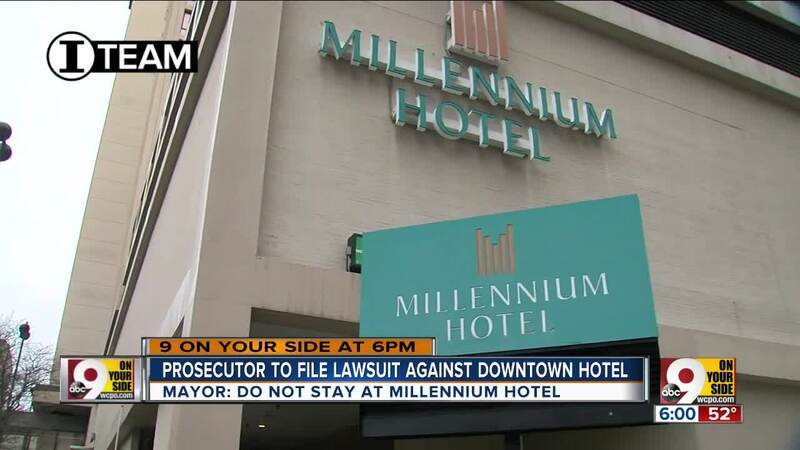 CINCINNATI — Cincinnati Mayor John Cranley winced as he listened to a reporter read aloud the mostly negative reviews from guests who had recently stayed at Downtown’s largest hotel – the Millennium Cincinnati. “Horrible, absolutely gross,” one guest wrote in a review posted on Trip Advisor’s online forum. “Smelly, dirty and pricey,” another wrote. “Worst downtown hotel ever,” wrote a third guest. For many years Cranley has tried to persuade Millennium owners to either renovate the hotel connected to the Duke Energy Convention Center, or sell it. Now Cranley and Hamilton County leaders are running out of patience. Cranley spoke with Hamilton County Prosecutor Joe Deters last Thursday and again on Tuesday to discuss filing a public nuisance lawsuit against the owners of the 872-room hotel on West Fifth Street. The hotel is part of the London-based Millennium & Copthorne Hotels chain. The majority investor in the chain is Singapore-based City Developments Limited. Deters told WCPO on Tuesday that he has instructed his civil division to begin working on the nuisance lawsuit, "immediately." A public nuisance action could temporary shut down the property. A judge would then decide whether the hotel stays closed until repairs are made. City and county leaders are also encouraging a developer to build a new marquee hotel on land owned by the Port just south of the convention center. If that happens, Cranley said he would tear down the city-owned skywalk connecting the Millennium to the convention center and rebuild the enclosed walkway at a new hotel. The Port and Cincinnati Center City Development Corp. (3CDC), which Cranley said is also involved in the proposed hotel project, both declined to comment. Hamilton County Commission President Denise Driehaus shares Cranley’s frustration. Driehaus and Cranley recently joined the Cincinnati USA Convention & Visitors Bureau’s board of directors so they could take a more active role in forcing change. “We’re going to ratchet up the conversation about the Millennium,” Driehaus said. Frustration with the Millennium is now at a peak after a decade of broken promises and collapsed deals, city and county leaders said. “We had several face-to-face meetings … we got pretty far down the road and the owner of the hotel would pull back,” Driehaus said about efforts to sell the property. Because Cincinnati doesn’t offer a new, modern hotel adjacent to its convention center, it has lost out on plenty of meeting business that went to other cities. The tourism and convention industry contributes $5 billion to the regional economy, said county administrator Jeff Aluotto, who points out that 30 percent of the county’s occupancy tax revenue comes from guests at the five largest Downtown hotels, including the Millennium. One of Cranley’s greatest fears is that Cincinnati ends up like St. Louis. The Millennium St. Louis, once an iconic part of the city’s skyline, is now vacant. The 28-story cylindrical hotel had a spinning glass-walled restaurant where diners enjoyed views of the Gateway Arch. The hotel chain closed the hotel more than five years ago, and now it sits vacant with a security fence around it. “Fortunately, we have had a number of other properties build in the marketplace that has added to our supply, giving us a better product than when the Millennium was open,” according to written statement from Explore St. Louis spokesman Tony Paraino, who declined to comment further. The Millennium chain has refurbished several of its hotels in the United States over the past few years, including One UN New York. It broke ground on a new hotel in Sunnyvale, California in October. The company’s website did not mention renovation plans for the Millennium Cincinnati, nor did Chairman Kwek Leng Beng mention the Queen City hotel in a recent press release on the company’s fourth quarter 2018 results. WCPO's ongoing series, Move Up Cincinnati, brings you stories about how people in our area are transforming our city and the way we get around. We will also tell the stories of those left behind -- and the people working to bring our communities together. To contact the Move Up Cincinnati team, email us at moveupcincinnati@wcpo.com .